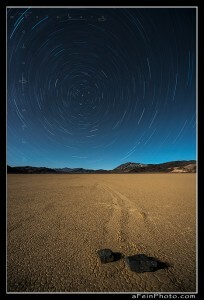 The Death Valley trip was an exciting one for me. A place I have seen so much of but had yet to actually experience with my own eyes (and lens). Having 4 full days allowed me to casually plan out places to capture depending on conditions. This flexibility meant leaving the Racetrack til last. The main reason being that I happened to visit during the coldest stretch of the season. Camping below freezing every night with daytime highs barely out of the 40s (til the last day). My thought process meant it would gradually warm up toward the end of the week and the Racetrack is at 3700ft, which means colder. Arriving at the Racetrack is no easy feat. 26 miles of washboard road. 4wd and high clearance recommended. After rattling my way for an hour the playa (dried ancient lake bed) appears as a white dish amongst the encompassing mountains. My heart beats a little faster and my right foot gets heavier. As I pull up to the parking area and hop out the sun is warm but there is already a chill in the air. 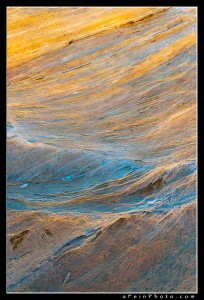 It’s late afternoon and the best evening light is yet to come but it’s about a mile from the car to the best rocks. These rocks, the reason I made this bone-jarring drive, move. On their own. And no one’s ever seen it. As they do they leave patterns in the playa. It’s speculated that a mix of wet playa and STRONG winds create this unique phenomenon (some rocks are upwards of 100lbs). So off I go, camera bag packed, extra clothes a must. Gloves, hats, long underwear…. As I trek across this overwhelming unique landscape I start to encounter the rocks. Different shapes, sizes, patterns. I have a couple of shots in the back of my mind to try and capture so finding the right rocks and patterns is essential. 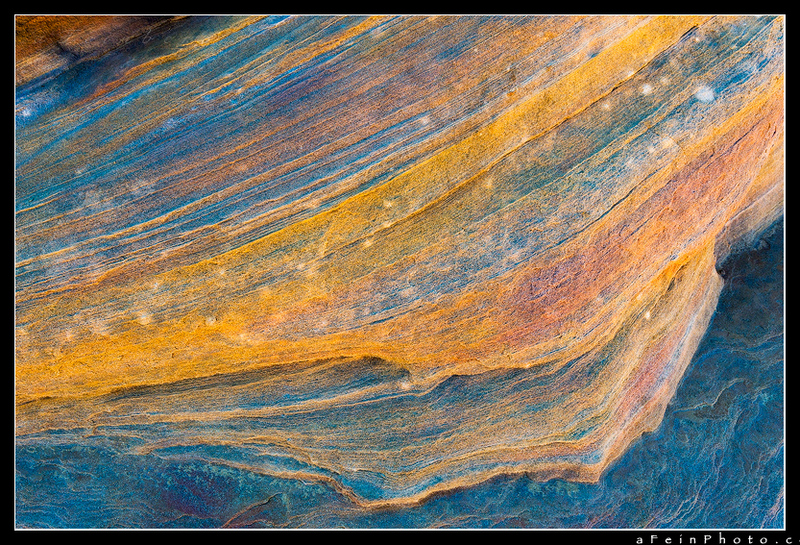 The first pair of rocks that catches my eye has me put a note in my head…ok…this is the shot. And I continue. Not 10 minutes later, as I explore further I come across the rocks you see below. Ah ha! Not the first one…THIS was my shot. Ok. Note. Off I go to keep shooting. The sun setting lower, about to disappear below the mountains for the evening. A group of 3 who was out in the corner packs up as the sun goes and they’re gone in to the twilight. I’m alone. Very very alone. It’s quiet. More quiet than one could possibly imagine. So quiet in fact that my ears are ringing. I find this quite confusing with my only explanation being that with modern life we have so much entering our ears constantly that the absence of which creates its own noise. Pretty amazing. I head back to the pair of rocks as the light is almost faded and the moonlight is taking over. Just a quarter moon but at a location like this it’s bright enough to see without using my headlamp. As I set up the shot I realize that the photograph would be much more powerful if the moon was a bit lower and casting a better shadow on the rocks. Well, the decision was made. I set up the camera and tripod, took the battery out and kept it in my pocket (batteries hate cold weather) and went back to the car for dinner. Let the moon set a bit and then attempt the shot. Funny thing about leaving a black camera and tripod in the middle of a place like the Racetrack. Not so easy to find! Luckily my way points combined with my phone made the process not as scary as it could have been. However, by the time I left the car the temperature was already in the upper 20’s. 2 pairs of socks. 2 layers on the legs. 4 layers on the body. 2 hoods and a winter hat plus my gloves. Yes. I looked quite hilarious. Now for the photograph. A 1 hour (yes, 60min) exposure of the sky. Calculating my settings and clicking the shutter I knew the only thing left was to wait. And wait. And wait. I walked laps around the playa. Laid on my back and watched the stars (shooting and still). Played some card games. And finally….that comforting click. I could pack up and finally warm up back at the car. Limited Edition of 50. Artist Proof of 5. Available ONLY through an aFeinberg Gallery. Please contact a consultant or email for more information! 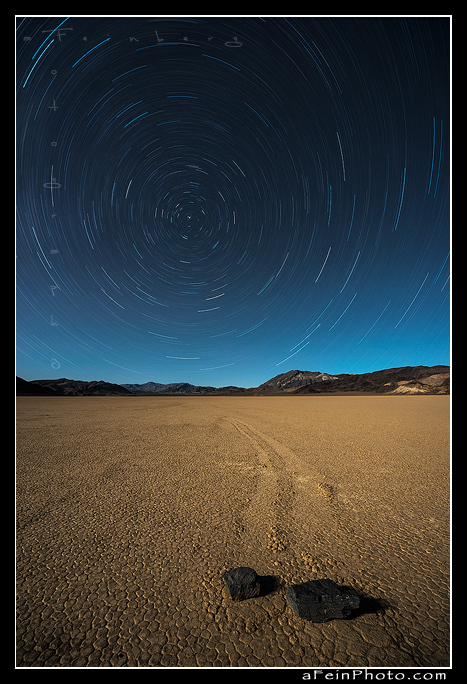 Posted in Image Discussion, Image Release, Tales From The Road and tagged death valley, racetrack, star trails on March 29, 2013 April 12, 2013 by Aaron Feinberg. There is something special about traveling by oneself. Of course there can be times of loneliness and solitude but the freedom to do/go/feel whatever one wants at that time is truly freeing. On my 4th full day I photographed sunrise in Arches National Park and then started my journey across the southern part of the state. Through Cedar Mesa and over toward Escalante. The remoteness and dramatic landscape is not to be underestimated. Truly spectacular country. Amazing spires and rock formations around every corner. 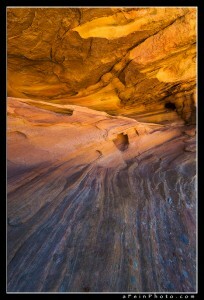 Roads winding through canyons, bending around corners to reveal another infinite expanse to explore. Posted in Image Discussion, Tales From The Road and tagged reflected, rock, travel, utah on March 26, 2013 March 26, 2013 by Aaron Feinberg. Settling in to my Utah adventure I had still yet to have that light that photographer’s chase. And knowing that desert country can be fickle with clouds I knew I would have to be patient. 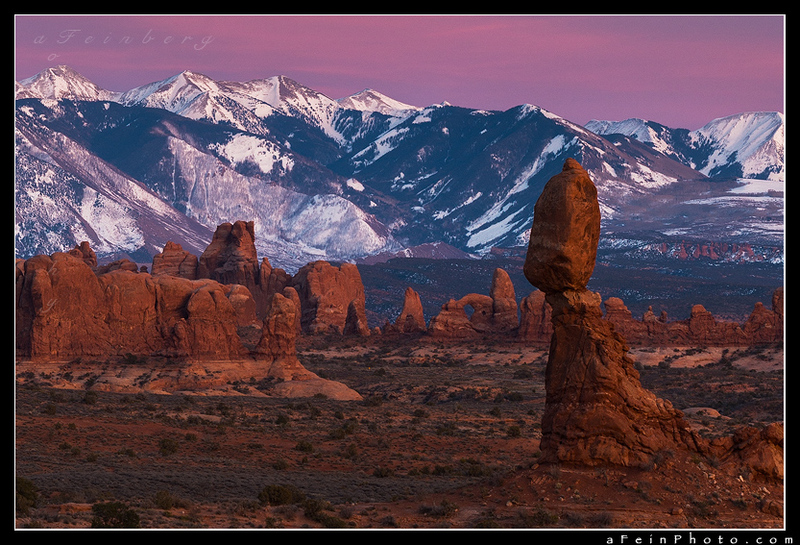 On this particular day I started out by shooting sunrise here, at Arches, under mostly clear skies. A few high cirrus but nothing to write home about. As I met up with a local photog, we palled around for the day talking story and catching up (we had been in contact for a while). After a midday break to kill some time (read: check out local brewpub), it was time to scout for sunset. And looking up the sky had now filled with all sorts of high clouds. A good sign. But then again any clouds are better than nothing! After driving around for over an hour, checking locations, thinking about light, hiking around, I made the decision for two spots. I thought facing back to the east was a good decision as hopefully the setting sun would illuminate the La Sal Mountains and high clouds. 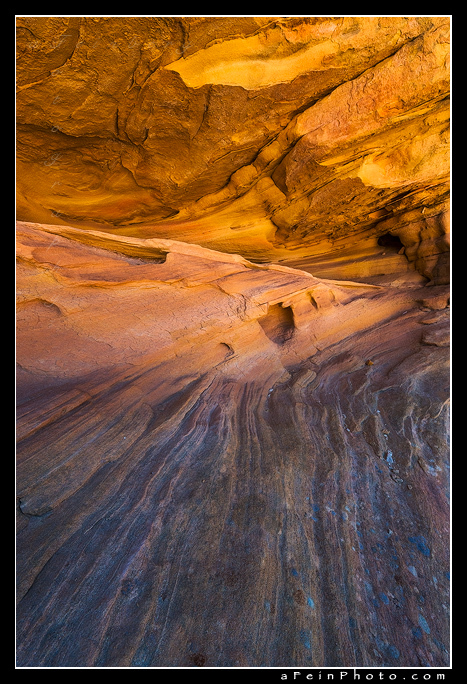 Then we’d try and hurry to another spot to capture Balanced Rock more intimately (that shot at another time). As the sun dipped, and the last rays of light cast upon the rocky landscape, first exiting the arches and hoodoos, then up the mountainside in the background, then finally the clouds slowly gained color. And of course this is where the little boy comes out and yips of glee start coming out. I never get tired of seeing a great sunrise or sunset and to be able to capture this moment over such an amazing landscape was truly special. P.S. To see a section of the detail in this photo see sample at bottom! 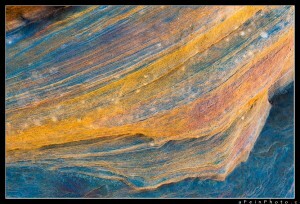 A sample of the detail in the panorama. This is a selection from the above photograph. Posted in Image Discussion, Tales From The Road and tagged arches national park, panorama, utah on March 25, 2013 March 25, 2013 by Aaron Feinberg. We start in the middle…which is a perfectly good place to start really. The middle of a 6 day road-trip through Southern Utah. This particular image was a side effect of an idea I had during sunset just a few hours before. 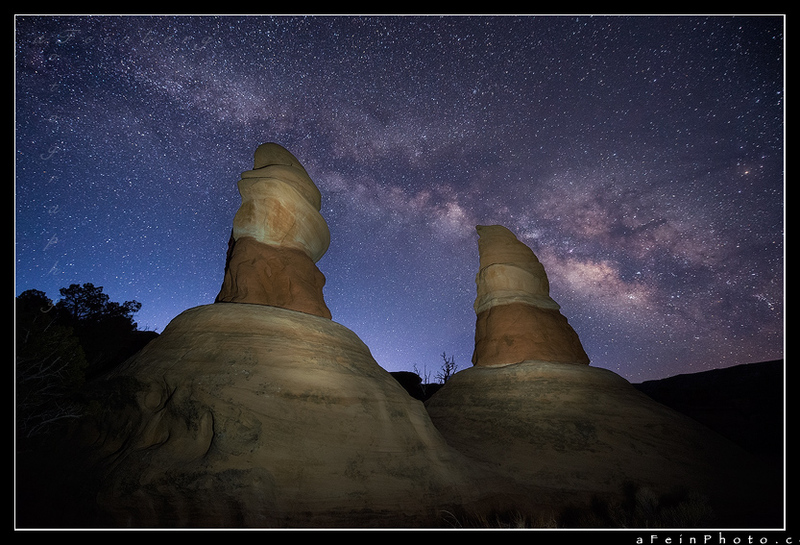 Setting my alarm for 515am, the mission was to capture the Milky Way under a rocky arch (an image I will share another time). Walking out to my location the stars were incredible. It’s called the Milky Way for a reason and the chalky streak across the sky sure held the name. I quickly went to capture the original image, which was preplanned, and then went back to explore other possibilities. These amazing hoodoos scattered the landscape giving this valley it’s namesake, Devil’s Garden. Seeing the blazing Milky Way behind I took two photographs, this one in particular illuminating the rocky statues. The touches of dawn beginning to be visible on the horizon. What a sight! Posted in Image Discussion, Tales From The Road on March 22, 2013 March 24, 2013 by Aaron Feinberg.